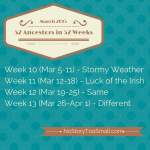 Posted in 52 Ancestors Challenge on February 5, 2015 by Amy Johnson Crow. 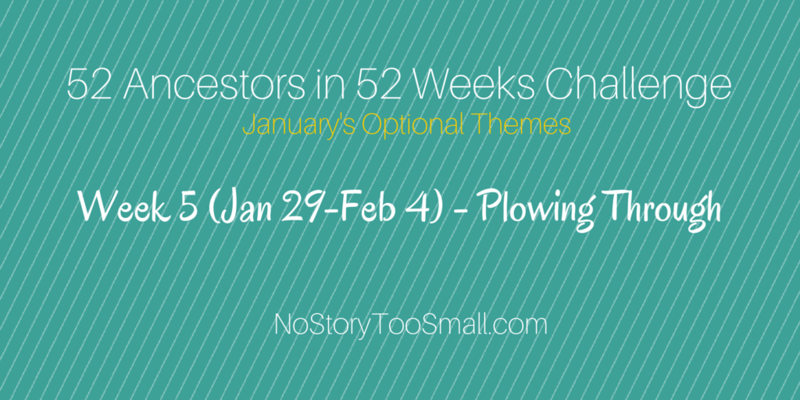 Participants took “plowing through” in several different ways. Schalene Dagutis from Tangled Roots and Trees shared how someone literally plowed through with her grandfather’s new tractor. 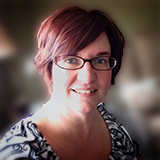 Amy Kelly at Shaking the Family Tree focused on her 4th-great-grandfather, Thomas Jefferson Poteet, Jr., “because it seems he plowed through life.” I would be remiss if I didn’t mention Colleen Greene of Colleen & Jeff’s Roots. She shared the story of George Walter Harless, who operated a snow plow in Yosemite in the 1940s. My story in Week 5 involved plowing through the research and not slowing down to see all of the clues. When I did take a moment, I formulated a theory of what killed my 32-year-old 4th-great-grandmother Mary Vaughn McKitrick. 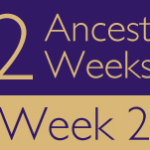 Leave a comment below with the name of your ancestor and a link to the post you did this past week. 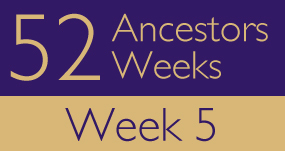 While you’re snowed in, take a look at the posts from Week 4! Stumped on how to approach these themes? I have some suggestions. James Rae 1804-1872 was my 3rd great grandfather. He was born in Dumfriesshire, Scotland. His surname is a bit of a mystery. Got to keep ‘ploughing through’ the research to find out more. Plowing through the clues and the resources trying to find my “brick wall” Stephen Francis Brennan. He is an enigma, seemingly appeared out of thin air. Plowing Through – I wrote about our family farming tradition and the number of seasons my ancestors plowed the ground. GIESE; Johann, Caroline, Auguste and Emilie – last seen on a shiplist from Hamburg to Hull and then vanished. I plowed through many files but couldn’t find them yet. Plowing through my research for an ancestor who, quite frankly, doesn’t interest me all that much, George Harvey Denton (1870-1918), my maternal great grandfather. The theme also seems to apply to his life, in the sense that he seemed to be plowing through from one state to another–Illinois, Louisiana, Kansas, Colorado–until he finally took root, or maybe just stopped. He might be George Harvey Denton, but I kept reading it as Harvey Dent. Ha! Harvey “Two-Face” Dent, DC comics–an enemy of Batman. Ha. I like your post, Amy. Blogger wants me to sign in, prove who I am, give them my account number–good grief. So I’ll just “Like” it here. Nice job with the sources! My 9th great-grandfather, Pieter Claessen WYCKOFF plowed the farm of Peter Stuyvesant in what is present day Brooklyn, NY. A story about a run-away tractor from the early 1900s found in my aunt’s brother’s unpublished memoir. A very literal take on the optional theme for this week. McQUEEN, David (1746-1788) Served in the Continental Army from the beginning of the war in 1775, until the very end in 1783. You’re welcome, Susan! I’m glad you’re enjoying the Challenge! My grandfather John Bardahl was born into a Norwegian immigrant farming family in Minnesota but left to homestead new territory, first in North Dakota and then northward into Saskatchewan, Canada, where he certainly did a lot of ploughing through. My great grandmother plowed through the early death of her husband, several children, and grandchildren in southern Indiana. No plows or plowing, but an introduction of the ONLY member of my Butts family line that I ever met. Sorry I am having website woes, and have to give you the site address instead of the page. Maybe some kind sole will add the proper url here? Rebecca Jane (Jennie) BUTTS Dawson. Thanks, Brenna. I just got computer service back, and was about to enter it myself. I wrote about my gg-grandfather who left his family in Sweden and settled in North Dakota…surely did a lot of plowing of snow there! Week 5 on my “52 Ancestors” Pinterest board – pins relating to my maternal grandfather, Clifton Leonard Brashier/James Bradford Harris – Clifton went missing for 26 years, then showed up as James (complete with a new wife and 3 more daughters). Whenever I do start a blog – I’ll be able to tell more of his story, for now it’s the short version through Pinterest pins! Although I am sure there were a few “snow storms” in the North Carolina Piedmont during the life of my ancestor Anderson JOHNSON, this is not why I wrote about him this week. Anderson was a Quaker who, like so many others, was persecuted for his beliefs and actions, definitely by the law, and I would guess by his neighbors, too. I thought of him and the topic “plowing through” because he remained devout until his death, even after losses and struggles. OATEN, William (1809-1894) Trull to Bath, Somerset, England. My husband’s 4th great grandfather. Gee, a link certainly helps. ANDREW, Harry Charles – my grandfather on my mother’s side who had to “plow through” his own struggles as well as the red soil of his family farm in PEI, Canada. My great grandfather, Emil Peters (1877-1955) was a “water boy” for settlers waiting to claim land during the largest Oklahoma land run… the Cherokee Strip Land Rush. I’ve had a fascinating week learning not only about the land run, but why they needed water so desperately and the job of these water boys. This week it was plowing through the snow – ugh. Glad I didn’t have to go outside to work on my article. TOWERS, Jane – Jane Towers Hawkins – a lot to plow through! A brick wall – I thought I might find a new clue for David Brown of Lancaster County, PA, if I plowed through the research again. No luck this time either! TERWILLIGER, John S(imon), 1800-1873 – As I plowed through my tree, I finally picked him! FISH Stephen Allen – Early settler in Vernon County, Wisconsin. I took “plowing through” a little more figuratively. My grandfather was a carpenter and a farmer. I wrote about how he plowed through the tough times, such as World War II and his little sister’s death. Julia Matilda Cruse – an Amazing life! Gad James. Or was it Gad Evans? — What caused the whole family to change their surname and tell no one? My post this week is about my great-aunt Maria’s first husband, Ernest Biel. He struck me as one exceptionally determined man. My 2nd great grandfather plowed through the “Winter of the Big Snow” and the historic blizzard of 1881 that dumped 2-4 feet of snow in Wisconsin. I live in Wisconsin and I have no desire to see that much snow! Carter, William. What on earth was he doing down there? This week I plowed through hubby’s Deyoe line in New York at http://www.genealogybyjeanne.blogspot.com/2015/01/52-ancestors-literally-plowing-through.html. This week’s post is about my father, a man with many stories (and wives….and kids….) ….and my “plowing through” the Genealogy Do-Over. MEISBERGER – 52 Ancestors 2015 Edition: #5 Will the Real Theobald Casper Meisberger (1837 – 1900) Please Stand Up? by Eileen A Souza at Old Bones Genealogy. Over the past year, I have been collecting Pennsylvania death certificates from Ancestry.com for my ancestors. So far, I have accumulated one-hundred and twenty-six (126) certificates. In doing so, I have uncovered a huge puzzle concerning my 2nd great-grandfather, Theobald Casper Meisberger, as reflected in his children’s death certificates. I wrote about my 4th great grandfather, farmer, John W Hall. (1785-1874; Montgomery county, New York). SCHERWITZ, Johann Georg(e). A shoemaker from a long line of city-dwellers finds himself buying farmland in the wild Wisconsin Territory – the family farm on my mom’s side. Plowing into some new sources for Magda Elizabeth Schmidt (1865-1949). My extremely late post for Week 5 is an unknown photo of an early tractor which was from a collection of photos belonging Edward Henry FELZIEN and his wife Eva Marie BURR.